Hi there, Glad you're back. If it's your first time visiting, I hope you will return often. Leave me a comment any time you're feeling it. I like comments. A lot! Well, this card is getting mailed to a fabulous person for his birthday. I gave birth to this fab person ?? years ago. Fooled ya - thought I was gonna say it, huh? I need to make two more Sept. birthday cards. I'm so tempted to use the owl punch again. I'll post them towards the end of the month. The shopping list for this card is next. Thank you for stopping by. It's been fun. Have a blessed week end. See you next week. Your owl is so adorable! I love your fall color scheme. Fabulous card! I hope to get playing with my owl stamp this weekend! Your card is really pretty - such a nice design. I am now following your blog. 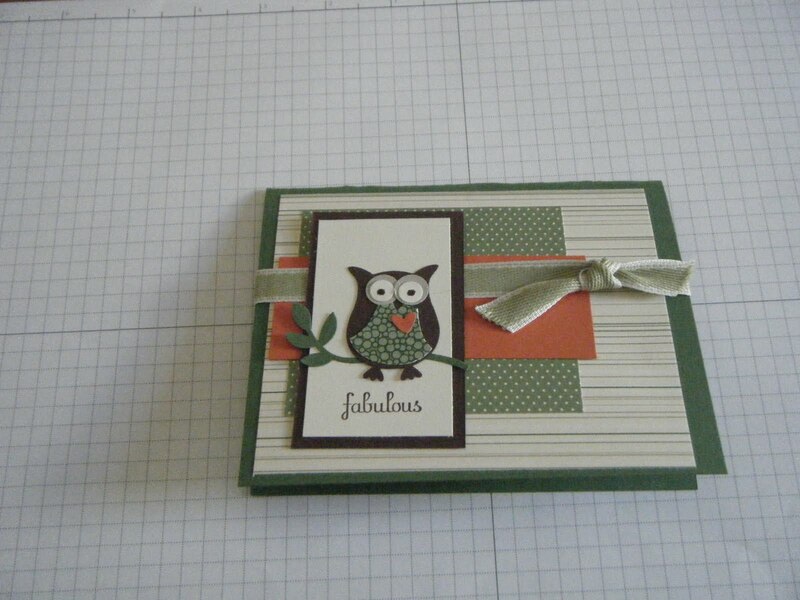 I love the colors and the layering in this card. Very nice! I am now following your blog. So cute, this owl always makes me smile!! Your fall colors is perfect for this time of year, too! An adorable card, Gloria! Love how you showcase the owl with this creation. Hmmm....I might have to look into the Woodland Walk paper again. Wasn't going to get it, but this is a great card using it. Thanks for sharing! So cute, love the owl and the way you layered the papers with the ribbon! Very nice!